A shower bath is a great choice for family bathrooms as it covers all bases. Read this expert guide before you buy to discover the range of options available to you. 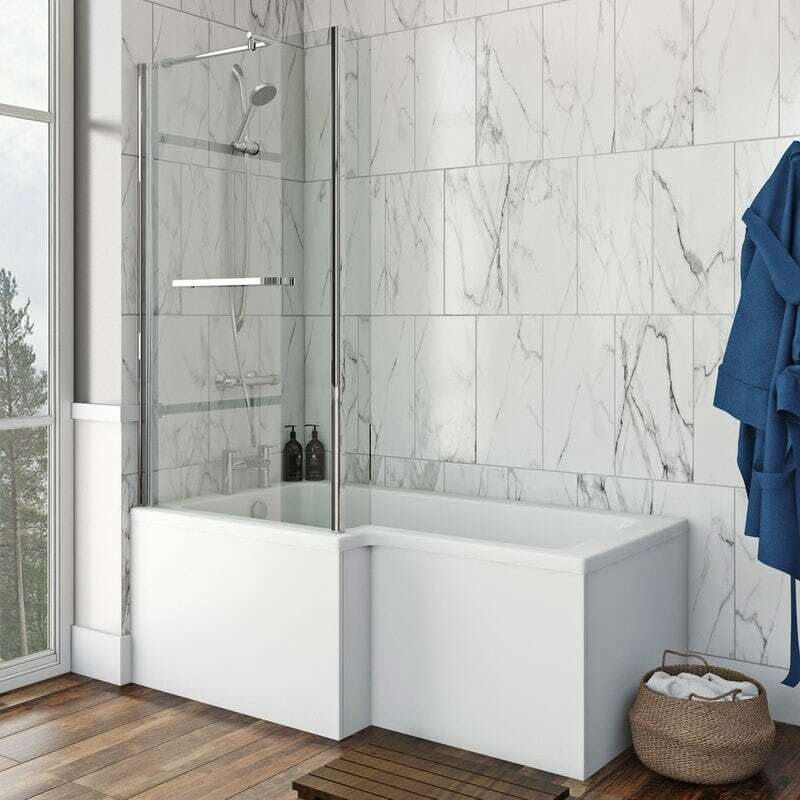 If you simply can't choose between a bath or shower, or have limited space in your bathroom, a shower bath is the perfect compromise. They range in both style and shape, from simple straight baths with screens to specially-designed models with an enlarged showering space. What is a shower bath? Many straight baths can have showers fitted over them, but a shower bath is specifically designed to create an ideal combination of the two. Though there are many different styles to choose from, they generally come in a P shape or L shape, with extra space and a shower screen at one end. This means you can enjoy a relaxing and luxurious bath, as well as having a spacious and practical showering area. 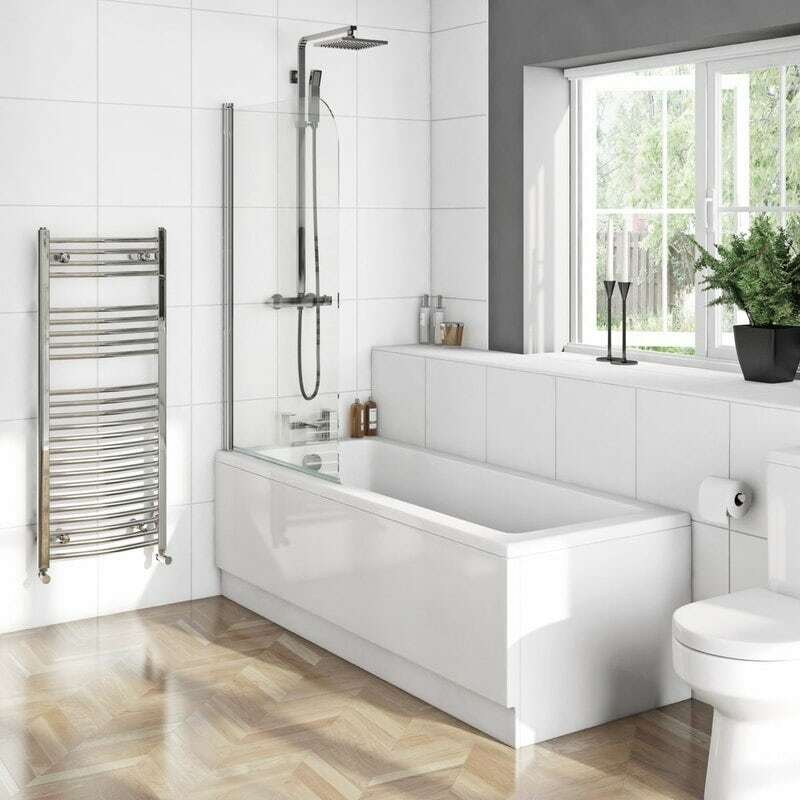 There are many different styles to choose from in our range of shower baths, so you can easily find one that matches your bathroom and your taste. If lack of space is a major consideration, the easiest option is to install a straight bath with screen. You can buy both the bath and screen together, which saves both time and money, or purchase separately. P shaped baths have a curved section at the shower end, with a matching curved screen, giving you extra space for showering, as well as an elegant look. The Orchard P shaped shower bath features this curved style, and also comes with the option of a convenient towel rail attached to the screen. 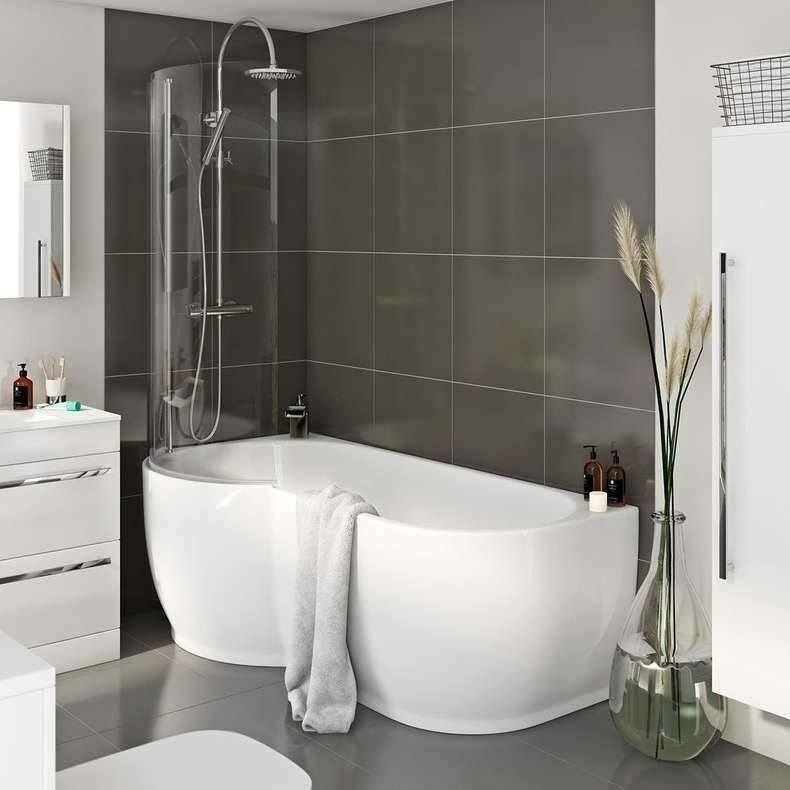 The Harrison shower bath from Mode Bathrooms (pictured below) has a similar shape, although the curved form is carried on throughout the rest of the bath design, for a pleasing style that is designed to fit with the rest of the Harrison collection. The L shaped shower bath features straight edges for a sleek, contemporary look. The widened showering area also features straight sides, with a matching shower screen. 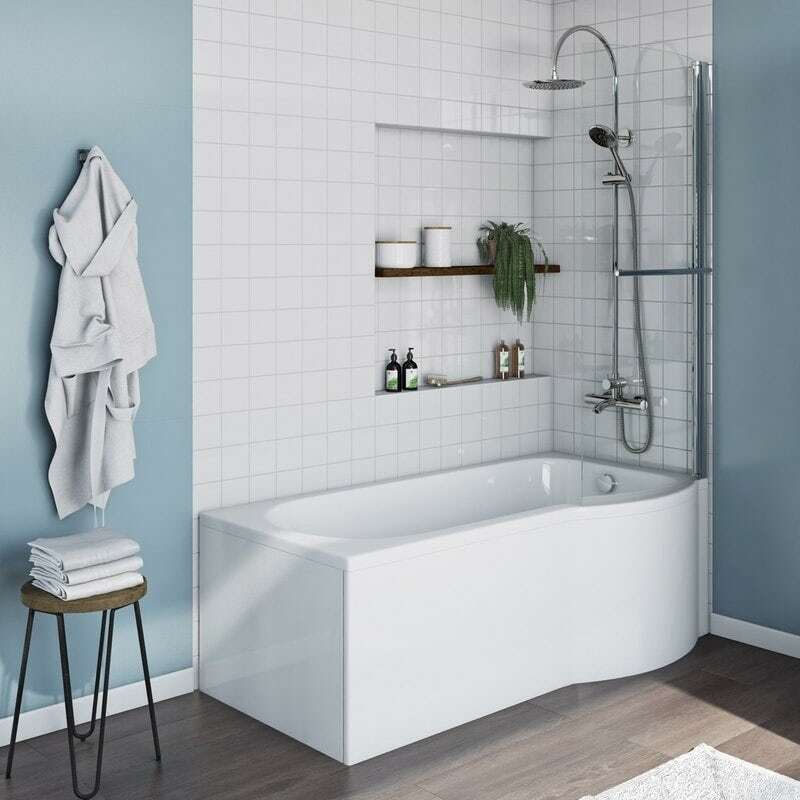 The Orchard L shaped shower bath (pictured below) is ideal for a contemporary look, with a screen and towel rail for added convenience, and a larger area for showering. You may not think a traditional style bathroom and a shower bath could possibly go together, but you'd be wrong! We've designed the stunning Dulwich freestanding shower bath from The Bath Co. (pictured below), with all the detail and luxury you'd expect from a traditional freestanding bath, but with the full functionality of a shower bath. Our selection of shower baths come in a range of sizes to suit different bathrooms, starting from 1500mm lengths to 1800mm. Always measure your space before choosing a bath, or measure your existing bath if you’re replacing it. Keep in mind that a shower bath usually has a wider section, which can increase the width needed by around 100mm. Most of our shower baths come in either a left or right handed option. It is important that you pick the correct option for your bathroom layout. The example below is a right handed shower bath, as entry is from the right hand side. With a straight shower bath, you can simply fit the shower screen on whichever side it is required. A bath panel allows you to complete the look of your shower bath, providing a sleek, seamless finish. You can also choose from a variety of colours and finishes, and match it to other bathroom furniture products for a complete look. Always check the full specifications of your chosen bath to see which bath panels it’s compatible with. A stunning bath tap can make a big difference to the look of your shower bath, as well as add some extra functionality. A waterfall bath filler is a gorgeous contemporary design that really feels luxurious and special, and combined with a stunning shower head can give you a really stylish look. Now that you are armed with all the facts you need, why not browse our comprehensive range of high quality shower baths and discover the right model for you. This guide will give you a brief introduction to bath screens, and an overview of the range available at VictoriaPlum.com. Many bathrooms aren’t large enough to incorporate both a bath and a separate shower enclosure. That’s where our design team here at VictoriaPlum.com come into their own! Did you know a five minute shower uses about a third of the water you’d use to fill a bath? 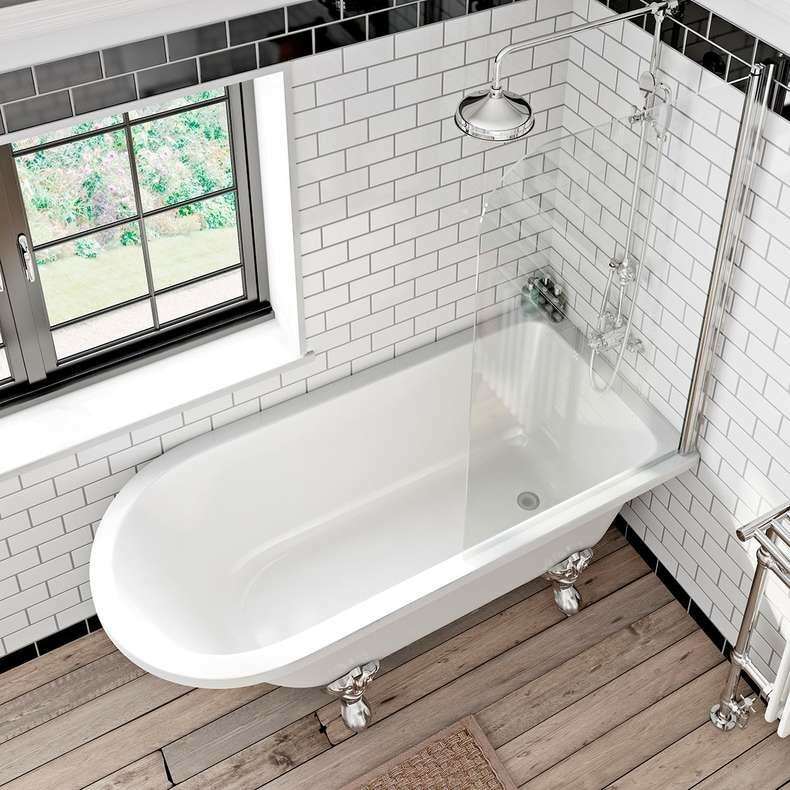 Find out why many people are swapping their the traditional tubs for shower bath.